It is homeschool convention season here in the US. As the current school term winds down, families are planning their purchases for next term. This also means that curriculum catalogs are starting to arrive in the mail. I always have enjoyed looking through them to see what new products are available. Yesterday, the post brought a catalog from Memoria Press. This is a curriculum based on the classical education taught to earlier generations. What makes this one a little unique is the emphasis on teaching children Latin from a young age. The curriculum starts out with a program that is designed for 2-3 year olds. For parents of special needs children, this age refers to their cognitive/developmental age rather than their chronological age. For families without a special needs child, you can use the age information as the chronological age. The following is a chart of the age ranges & programs available. Simply Classical Curriculum is a full program and it also has plenty of supplemental materials if needed. The lesson plans for the Levels A-C include a space to record therapy homework/activities which makes it easier for those having to follow an IEP program. The program can be completely tailored to the child’s specific needs. You can take it as slowly as necessary to ensure that your child is retaining the information and skills being taught. I am seriously looking at this as a foundational curriculum for Pookie. The Letter of the Week curriculum that I previously talked about can be used as supplemental work. After years of searching for a homeschool program designed for children with significant developmental delays, this curriculum may be a great find. It is definitely worth looking at. I wanted to share today some of my favorite resources for ideas to use in homeschooling Pookie. With the significant developmental delays that he is having to overcome, I try and incorporate occupational therapy styled activities wherever possible. There are many websites for OT activities available online. Here are some of the best “go to” resources that I use. Therapy Street for Kids is a database of ideas that are categorized by the developmental skill that you are working on. When putting together Pookie’s TEACCH tasks for the day, I choose activities from the areas that I want him to focus on that session. The activities listed require minimal supplies. To date, I have not had to purchase anything special to do the tasks. I do love the fact that the activities that involve specific types of games give me ideas of what to purchase when I see them on sale or at a thrift store. If you happen to be unfamiliar with the developmental skills listed, the site also provides a very thorough explanation of the skill. OT Plan is a searchable database of OT activities that you can use. I love the fact that I can search by skill or by materials used. For example, if you have cotton balls, you can click on the Materials search button, scroll down to cotton balls and click. You are then taken to a skills page. Once the skill areas are chosen, you are given suggested activities. OT Mom Learning Activities is yet another resource that has the activities categorized by skill. Like with the other sites, the materials used are basic ones. Within each skill level, there are activities that you can do using what you already have at home. The Ultimate Guide to Autism Home Therapy on the Meet Penny blog is a comprehensive listing of their favorite blogs and websites for OT activity ideas. I love this listing and have found ideas at each resource. Tabitha, who writes the blog, was in a situation where she had to become creative in providing therapy activities for their own child. The result was finding these blogs. The ideas are very effective and fun. Best of all, you can make them on even the tightest of budgets. Your Therapy Source is an online resource for Occupational and Physical therapists to purchase materials they often use in their sessions. I found a page however that is a long list of activities that you can access for free. Make, Take and Teach is a blog that has free printable activities available. At the time I am writing this, they are offering a Mitten Match game. The child matches pairs of mittens by doing the math problem. For example one mitten may have the problem 2+3 and the other will have the answer 5. Teaching Ideas is a UK based website. This link takes you to a special education resource directory. I love this page in that it not only has activities but gives advice on how to teach a special needs child. Childcare Land is a favorite site that I have been using for several years. I first found it when I was doing preschool with Little Miss. Lots of ideas for preschool level activities. Autism and More is a website set up by occupational therapists to serve as a support for teachers and parents. MontHome is a site with a plethora of activities that are inspired from the Montessori educational method. The activity bin ideas are perfect fit for TEACCH style homeschooling. On Pinterest, you can find a wide range of ideas for educational and developmental skill building activities. DIY Montessori Activities is a collaborative board which has pins from multiple people. The ideas that are gleaned there have been especially helpful. I hope that these websites offer to you some ideas to build upon with your own children. The activities are easily assembled for workboxes, trays, or activity bags. Write onto an index card the information about the activities that you are wanting to assemble. Place the cards into a recipe box with divider tabs categorizing the various developmental skills or school subjects for quick reference. You can further organize these cards by using a different color marker to make a line across the top edge of the cards to color code the categories. Tuesday we made the journey to Tulsa for two appointments at Therapy Works. I am so happy with how it is going. Pookie was fitted a few weeks ago with leg braces referred to as “rabbits.” Rabbits are a brace that stabilizes the ankles, supports his arches which collapse as he walks, and the top portion of the braces resemble rabbit ears. The “ears” are extensions that come up the sides of his calves, leaving the front and back open. One of the functions of these supports was to prevent him from toe-walking, which he does nearly constant. From the first day that he wore the supports, Pookie continued to toe-walk. Within a couple of days, he had the front of the support that is under his toes looking curved upward. It was clear after a few days that these were not going to work. His PT then ordered a new set of supports called “kangaroos” which provide more restriction of movement. Unlike the rabbit style that has the open back at the calves, the kangaroos are solid. On Tuesday, Pookie was fitted with his new supports. Laci, the therapist that fitted him, had Pookie walk in them so she could see how he managed. Immediately, he was toe-walking again. She was very surprised. After getting a second therapist’s opinion, it was decided that if he is still toe-walking when we go back next week they will add more rigid support under the toe area to hopefully prevent him from walking on his toes. After that appointment we had a light lunch before going to his OT appointment. His OT, Amanda, had arranged for a rep to be there so Pookie could be measured for a medical stroller. What a blessing it will be! He doesn’t have the endurance to go places where a lot of walking is involved without a wheel chair or some other assistance. He is tall enough to not fit in shopping carts or standard strollers anymore. So, the medical stroller is going to be a huge improvement for us. He will be able to enjoy outings much more often. After the rep was finished, Pookie did some FloorTime therapy with Amanda. By the time they were done, he was singing in his own way the song “The B-I-B-L-E”. During their play time, Amanda would stop at intervals and wait for him to sign “more” for her to continue the play. He loved it. At that time, she had him swinging in round hammock style swing. He was laughing and having a lot of fun. When his therapy time was done, Pookie actually was resistant to leave. He wanted to stay and continue to play with Miss Amanda. It was a great day. The most productive so far. I can’t wait to see how he responds and grows through the therapy over the next year and beyond. This week, we began our new school term. Little Miss is enjoying her new materials and seems quite pleased with what she is learning. It sure was a treat for her to start out in science learning about tide pools! We kicked off the week by stopping at the OKC Zoo on the way home from church on Sunday. We arrived 4 hours before closing, so we went straight to their new Stingray Bay exhibit. There, we were able to touch the stingrays as they small in their pool. Afterwards, we went to the zoo’s tide pool exhibit to touch as experience the sea stars and other sea life that was in the replica tide pool. It has been a shift in routine to get the kids back into the homeschool mindset. Little Miss is having to relearn time management skills. I set the timer for 30 minutes for each assignment, then she as to complete her work before the timer goes off. If it is not done, then it is set aside to be finished during her free time at the end of the school day. The hardest one to help accept the routine change has been Pookie. Taking several weeks off for a summer break was a mistake. He became so adjusted to being able to play all day that he was resistant to doing his schoolwork. After a rough first day, I remembered a motivator idea I had used with him a couple of years ago. I no longer had that token board, but came up with this idea instead. In the above picture, you can see a half egg carton with plastic eggs in it. I placed a gumdrop into each egg. Pookie happens to love to eat anything like gumdrops or gummy bears. He watched as I put them into the eggs. In order to get a gumdrop, he had to complete an activity. He did really well. He would finish an assignment, hand it to me, then I would allow him to choose and egg. I opened it for him and he enjoyed to reward. The school day went SO much easier after we started this. I will not always have a sweet in the eggs. Maybe have a few cheese fish crackers or other snack. Eventually, we will ease him into getting a small container of snacks after completing a series of assignments. This past month has been one with a huge leap forward for Pookie. He began feeding himself finger foods and with aid would use a fork or spoon. Yesterday, he finally began to eat with a fork completely on his own! No one had to help him hold the fork or assist in getting his food onto the fork. He did it completely by himself! Having a child with severe autism, you never take for granted the steps they take towards independence. With each step that they take forward, they gain a confidence that cannot be gained in any other way. Mealtimes used to be a time of stress. Pookie would try to indicate what he wanted, then get upset if you didn’t give him a bite of the specific piece of food he was pointing to. He also became upset if you didn’t give him a bite as quickly as he wanted. It took a while for him to accept that he had to take turns, allowing you to have a bite of your own meal in between him being fed his meal. Now that he is feeding himself, he is happier at mealtimes. He sets the rate at which he is fed and can choose which piece of food to eat. He has control of his meals. During this past week, he has stopped using a booster seat at the table also. This has him very happy as well. He is able to leave the table on his own when he is done eating. July is here and I am wondering where summer got the idea to be in such a hurry this year. Daddy is going to be taking his vacation time in a few weeks. Once he returns to work, our new school term will begin. Last week, I made 20 file folder activities for Pookie. They are very easy to put together. Being that he needs a lot of repetition to learn new skills and information, I used a Pre-K level workbook from a discount store. I looked through the workbook and chose pages that contained mazes, matching, dot-to-dot, and cut & paste. The mazes and dot-to-dot pages were glued to the inside of a file folder with one page per folder. The matching pages are the type where a line is drawn from a picture on the left to its match on the right. These were also glued into file folders. The cut and paste pages were slightly different. The part to be cut out was in the bottom section of each page. I trimmed that portion off and glued the upper portion (picture part) onto the file folders. The bottom portion was left intact and set with its folder. I took all the files to the Mardel’s store to be laminated. I LOVE that store! They have a self-service heat laminating machine that is large enough to laminate a poster. The cost of laminating is 25 cents per foot. I laminated all the file, along with the cut & paste strips, for a cost of $5.00. Once I got home, I cut off the excess laminate from around the files. For the cut-n-paste activities, I cut out the pieces for each file’s activity. Using self-adhesive hook & loop dots, I adhered the pieces to the file folder. Another self-adhesive dot was placed on the area of the picture where these pieces were to be placed. This serves the purpose of Pookie having to match the pieces to their proper place in the picture. With his delays in fine motor skills, the activity would have been impossible to do if he had to cut out and paste the pieces. He currently doesn’t have the ability to use scissors. 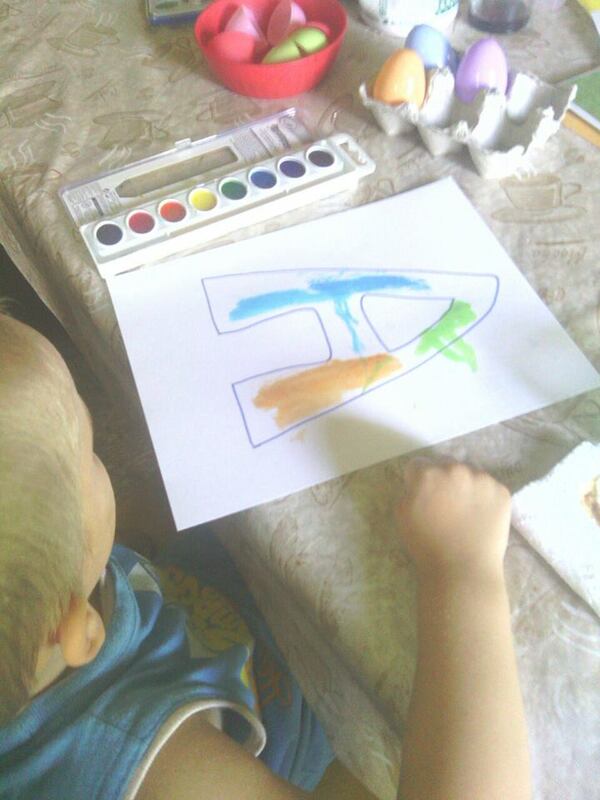 By making the activity into a file folder game, he will now be able to complete the picture. I have been having trouble getting pictures uploaded, but will post some as soon as I am able to figure out the problem. These activities are great for tucking into a workbox. Another great use of them is to take them along with you when go to an appointment. I have used these when we spend the afternoon at the library. The kids are able to do a bit of homeschooling while they wait for a computer to become available. Next, I will be making some of these file games for Little Miss. Being that she is going into 2nd grade, her will be more challenging. A page with multiplication facts for each number will definitely be one of the types of files I make for her. There is so many possibilities! This past week, our son finally made a huge leap forward. He has not even been feeding himself finger foods for nearly 2 years. Suddenly, on Sunday, he gave it a go. One Monday, I cut up his peanut butter & jelly sandwich so he could feed it to himself. With only a little encouragement, he began feeding himself the sandwich. Our daughter and I cheered him on after he finished his lunch. That night, I make the kids one of their favorites pancakes for dinner. It is a treat that we do once in a while. For some reason, the kids love having “breakfast for dinner” once in a while. After I cut up Pookie’s pancake, I put the fork in his hand. Up until now, he has refused to even try holding a fork or spoon at mealtime. This time, he was receptive. I had to help him get a piece of pancake on the fork, but he was able to take over from there. He fed himself with a fork for the first time! The following morning, he had cereal for breakfast. I had to use very little milk in his bowl. The extra milk made it too difficult for him to scoop up the cereal in his spoon. 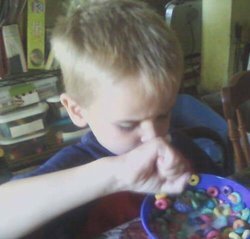 I had to aid him in scooping up the cereal, but like before, he was able to feed himself. Over the last few days, he has been fluctuating between doing it on his own and at times, needing help. Overall, he is feeding himself at each meal and snack. It is such an exciting time for us! I am SO proud of him.